Above & Below: Misa's A Sin Worth Committing. Above & Below: BB Couture's Sea of Cortez. Above & Below: OPI's Dominant Jeans. 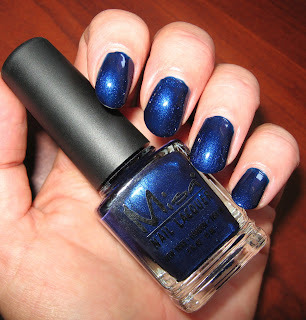 I had intended to do a NOTD using Misa's A Sin Worth Committing and then matte it because I think a dark blue would look nice matted, but I am stupid, so that's not what I ended up with! I painted my nails in the Misa, photographed it, then removed the polish. Two fingers were cleaned off and then it dawned on me that I was going to matte it so I could show it to you both ways. Oops...oh well, I just did a couple of more blues instead of re-doing my original idea. A Sin Worth Committing is a lovely dark blue shimmer, BB Couture is a sparkly medium blue and OPI's Dominant Jeans is a shimmery shade, a slight bit darker than a sky blue. 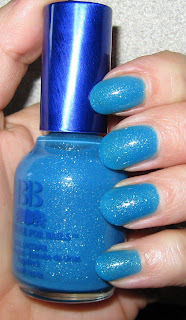 The Misa applied wonderfully in 2 coats, the BB needed 3 coats, and the OPI, 4. That's all for today, I hope you all have a relaxing weekend! Wow Sea of Cortez is is really lush, it looks so glassy. Would love to have that Misa, it's a stunner, the Opi is cute and summery as well. can't wait for my sea of cortez to arrive - look so awesome! What attractive blues,they all are! I don't have any of these! I've done something very similar. When taking photos. I put a polish on. Then I'm supposed to take a picture of it. Before layering a glitter. But instead of taking the picture....I go ahead an apply the glitter....lol! And only realize what I've done. After painting two or three fingers! Oh well! Love all three shades! 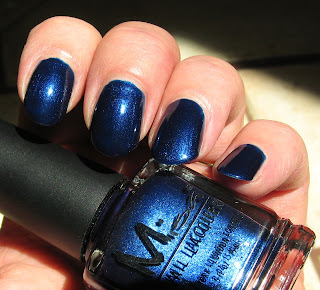 I must really like darks because I'm drawn to the Misa one but the the OPI blue is so pretty and summery. Nice blues ! I have the Misa, love it ! I have the Misa ...love it! I almost got the BB and changed my mind at the last minute! I got my order yesterday! have a great weekend! The Misa is beautiful - it makes me think of a dress I had once for a Christmas party. Not so keen on the BBC but can't really put my finger on why. I'm sooo glad to see a swatch of Dominant Jeans. I have hovered over buying this one many a time so thankyou very much for allowing me to see it in the flesh, as it were. Mary don't call yourself stupid! Your doing many things with this blog. Plus your a Mom and have a million things going on with that. I love the Misa. I have to check and see if I have it. I have Sea of Cortez and it's a beautiful shade. I don't have the OPI and that's also pretty. I got my BB polish order. I love all the shades I ordered. They do look more fall colored. I do have two light ones but the rest are dark. Just gorgeous though. I may order more! Thanks so much for your blog. I really enjoy it. Clockwork~thank you! The Misa is really pigmented and has such great coverage in just 2 coats. Love all 3, but the Misa is so rich looking. Nixxy~I think you'll love it! It was a bit thinner than the other BB's I've tried, but still very pretty. Kristine~thanks! I'm not much into blue clothing either, unless it's more teal or turquoise! Kae~that Misa one really stands out to me also, I'ts very deep and shimmery. Celine~thank you. The Misa is a stunning polish! Kitty~sound like lots of us have this Misa :) Enjoy your weekend! Helen~all nice blues, but the Misa is probably my favorite of this group. Lucy~I know I have too much going on, and sometimes I forget what I'm doing! I think I'm going to place one more order too, I'm so in love with these polishes! OOO! I like all of these! Especially OPI~ Dominant Jeans. That's just gorgeous. And the BB Couture! Awesome! 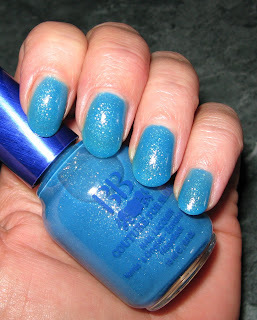 That is a eye-catching blue &2 coats... hmmmm That is going on my list. I love how the sparkels/shimmers show up in those BB's..
You are doing a great job with your blog... and are sooooooo far away from the s-word. Keep up all your good work for us! Olivia~I liked they way they all turned out, too. Thanks! I like each one in it's own way. Deez~you are too kind :) Thank you. The BB's have such a distinct finish and specific type of sparkle, it's hard to describe.